I'm always crazy about kimchi. But then again, I'm always a sucker for food with pungent aroma (still working on Stilton and Roquefort, though). I might even be slightly addicted to kimchi, and I found out lately that kimchi fried rice has become one of my comfort food. Leftover rice from last night's dinner, one cup of ripe fermented kimchi, less than 15 minutes to cook, it can't get easier than than. The addition of pork is not necessary if you choose to go all herbivore. This dish tastes wonderful even without the addition of meat. But on the flip side, add any kind of meat you wish to have, even seafood. Serve with fried egg with runny yolk on top. 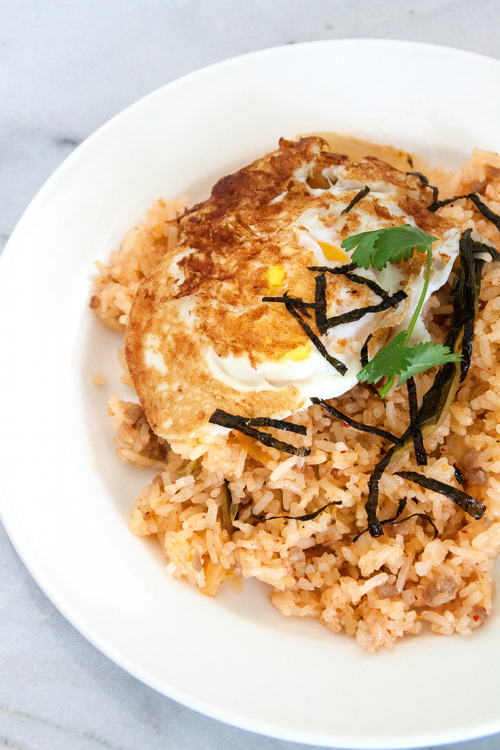 Break the egg prior to eating so the yolk permeates the rice, thus enriching the flavor of the rice. In a large skillet, heat sesame oil over high heat. Add garlic and chopped scallion, cook until tender. Add ground pork, stir-fry until cooked though. Add chili paste and kimchi into the skillet. Toss and cook for another 3 minutes. Add rice into the skillet, fry over high heat, toss to combine. Continue cooking, stirring only occasionally so the rice has time to brown on the bottom. We want crispy brown bits in the rice. Season with salt, toss and continue cooking for another minute or two. Turn off the heat. Divide rice into 4 individual plates. Top each with fried egg, and sprinkle shredded seaweed over the rice. Serve immediately. 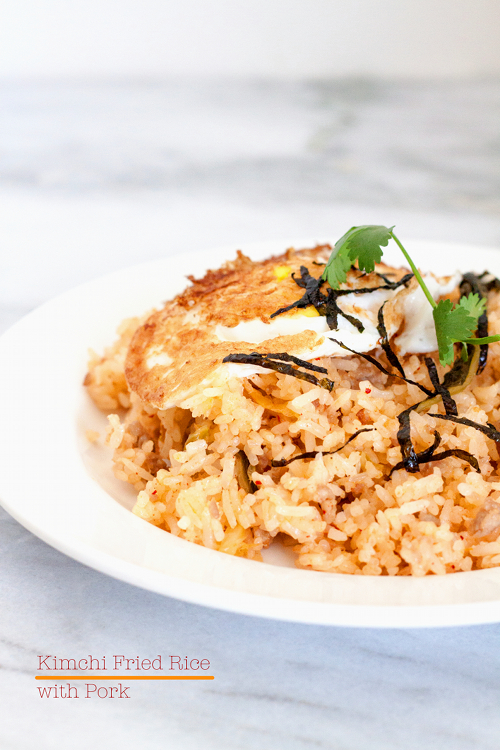 I just made your Kimchi Fried Rice, and for once my plate looks just like yours, Delicious. i'm Korean . im so happy to see korean treditional dish at here.!! actually I recommend for this recipy to add some soy sauce about 2/1ts. What is that black one?